On Friday April 12th, a Rogers Park bicyclist was riding his bike down Chicago near its intersection with Main Street in Evanston. At the same time a Winnetka man was driving his car down Chicago. The driver apparently did not see the bicyclist and made a right turn in front of the bicyclist and caused the bicyclist to crash. This action where the driver turns right into a bicyclist or right in front of a bicyclist is known as a "right hook." As a result of this right hook the bicyclist was thrown to the sidewalk where he sustained a fractured thumb. The bicyclist was taken to the emergency room at nearby St. Francis Hospital and will require further treatment from a hand specialist. Chicago is a main street that run roughly north/south through Evanston's downtown and becomes Clark Street at the Evanston/Chicago border at Howard. As such, Chicago is a main bikeway in Evanston for bicyclists riding towards Sheridan Road and the Lakefront or who take Clark Street straight into the Loop. Given the proximity to the lake and the number of bicycling students at nearby Northwestern University, the presence of bicyclists in the area is an extremely common event. 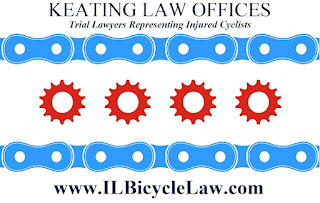 The Illinois Bicycle Lawyers at Keating Law Offices have been retained to represent the injured bicyclist. 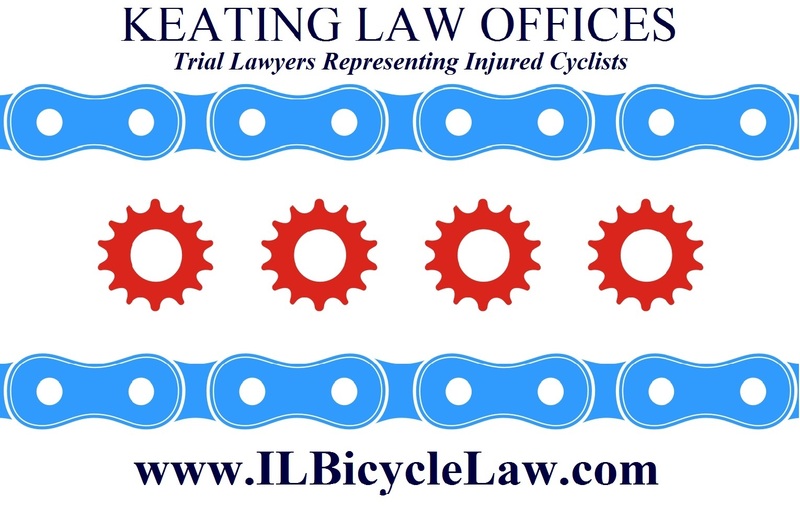 Coincidentally, the injured bicyclist works at a nearby bike shop as a mechanic and attorney Mike Keating lives in Evanston and himself rides down Chicago regularly and is familiar with the roadways and traffic patterns in the area.